For many people, living alone isn't an option. Because rent and all utilities are split when people share living quarters, it makes financial sense to have a roommate. However, there are a lot of problems that you can run into when you share a space with somebody. 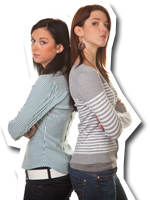 Even if you're best friends with the person, you're not immune from some common issues that can arise when you live with somebody else. Unfortunately, the only way to circumvent the inevitable arguments, passive aggressive behavior and overall unpleasantness that can move in with your roommate is to have "The Talk". While it will quite possibly the most uncomfortable discussion you and your roommate will ever have, The Talk is an absolutely necessary evil. With that said, there are certain things you can do to make The Talk less painful. First, be totally open and honest, and encourage your potential roommate to be the same. While the answers to your questions may not be ideal, it's better to know now that the person you're considering living with is a raging alcoholic than to discover it at 4am when you have early classes the next morning. Do either of you smoke, even occasionally? If one smokes and the other doesn't, does the smoker mind taking it outside, even when the weather is unpleasant? Which drugs do you do? Also, what is allowed in the house? Is marijuana okay, but crack cocaine crossing the line? Spell everything out, so later on nobody can use the "but I didn't know!" excuse. Are either of you'recovering from an addiction? If the idea of having a roommate who is always around the house, leaving you with no alone time is not your cup of tea, you should probably make sure your potential roommate isn't "taking some time off" and plans to kick back most of the time. How do each of you feel about overnight guests? If you're both okay with it, it'd be a good idea to set time limits for overnight guests. Otherwise, you might end up with a significant other who stays over five nights a week but never pays rent. Speaking of guests, it's smart to agree not to give anyone else a copy of the key before signing the lease. If the idea of a roommate's boyfriend or girlfriend staying over all the time doesn't sit well with you, having that person in the house when you and your roommate aren't, probably won't go over so well either. Is your future roommate a neat freak, but you're a slob? While it may be kind of embarrassing to admit that you're room is always a pig sty and you only wash the dishes when there aren't any clean ones left, it's something you have to be honest about. How do you feel about sharing your property? Do you want your roommate to ask before listening to a CD of yours, or are things like that fair game? How will the chores be split? What about groceries? Will you share or will each of you buy (and eat!) your own? This is by no means a complete list of things to discuss during The Talk, as each set of roommates will have a unique set of issues. As long as you have some form of The Talk before you sign the lease, you'll be taking the initiative to protect yourself as much as possible from heartache and headache later on down the line.